In October of 2012, Hurricane Sandy blew out the power in my region like an exuberant child extinguishing birthday candles. That same event rekindled my love of table top games. I stayed with my parents through the storm because their town was supposed to receive a less direct hit from the storm than mine. Comically they lost power for two weeks, and my apartment lost it for about 30 seconds. Each night after the storm my parents and I played a game of Pandemic by lantern light. 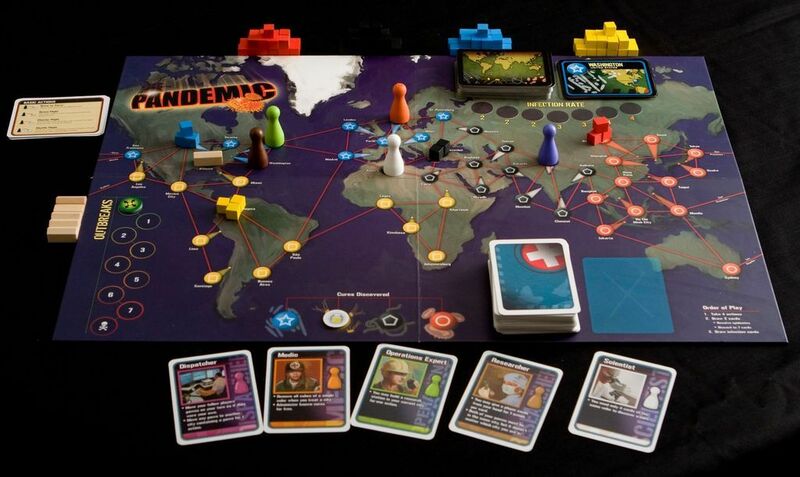 Pandemic is an easy-to-learn, difficult-to-master cooperative game where a group of people play as a team trying to prevent the spread of four different viruses around the globe. All of the players work together against a relentless board. We were all new to the game, and sitting there in the darkness trying to reason out how we could possibly win as the odds continued to stack against us is one of my fondest adult memories with my parents. The memory bubbled up because Quintin Smith of the brilliant tabletop gaming website Shut-Up & Sit Down put this post up in memory of his recently deceased father. It made me all sorts of introspective. Post Sandy, board games or table top games have pretty much pushed video games out of my life. What I loved most about video games was playing them with other people… Other people who were in the room with me; and that’s not how video games have evolved. Video games have absolutely become much more multiplayer focused than they were when I was growing up. However that multiplayer has shifted from a friend in the room to people over the Internet. That just doesn’t do it for me. I want to play games with people I know and love in the same room. Whether I am playing with them to try and outsmart a deviously aggressive board like Pandemic, or against them as I try to outwit them in a game like Cyclades, it’s the in person, human experience that I crave. That I loved about Halo and Halo 2. I work from home most days, pushing pixels and video conferencing. When I unwind, I want the experience to be tangible. You can expect more tabletop gaming posts. I’m shocked it took me this long to really write about it.